First, just as FYI, I have added a “Pattern Notes” page up there along with the other blog tabs. Pattern errata, miscellaneous notes, whatevs – they now have a home. Hooray for making the patterns better. But second, and most important, I must report from my day in Toronto yesterday. 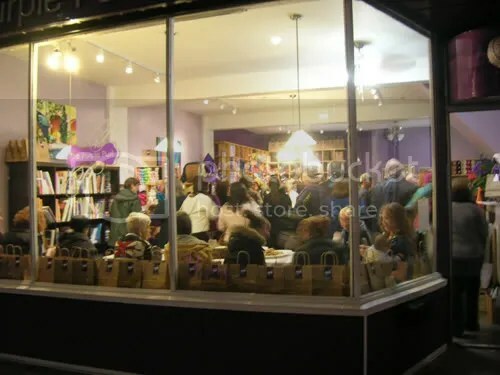 There was the “work” time in the earlier portion of the day, but what I’m really here to post about is the grand opening of The Purple Purl, Toronto’s newest yarn shop on Queen St. East. I met Jennifer back in May and she has been a great knitting friend and now she and her friend Miko have made all knitters’ fantasy their own reality, and taken the plunge into LYS ownership. The yarn portion is open for business but they are just waiting on a bit of beauraucracy for the cafe part to open. Then it’ll be yarn + lattes and good relaxing times. I chatted with the woman whose company sold them the Espresso machine, and it turns out they also sold Alterknit their espresso machine. I think she was under the impression that all yarn shops are also cafes. If only that were true. Anyhow, thanks Jennifer and Miko for making me yet more depressed that I no longer live in Toronto The Land Of All Awesome Knitting Places. 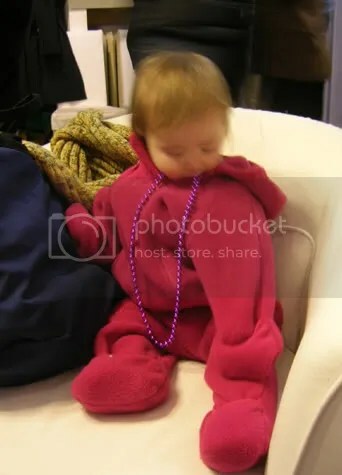 I want to be just like you when I grow up. And maybe come and live in a corner of your shop after my dissertation is done. Heh. Only partly kidding. They are stocking a variety of Canadian yarns (oh hello, Indigo Moon, you beautiful dark mistress), and development-conscious ones as well, like the lovely Mirasol line. Metal and bamboo needles can be yours, nice selection of SWTC stock, and a great bookshelf that I could totally sit in front of for an hour. There were lots of great people there and I wish I could have stayed longer. I could not, of course, resist getting a picture of wee Clara (great visit with her and mama Emily), even though her cuteness is so great that it seems to defy focus. 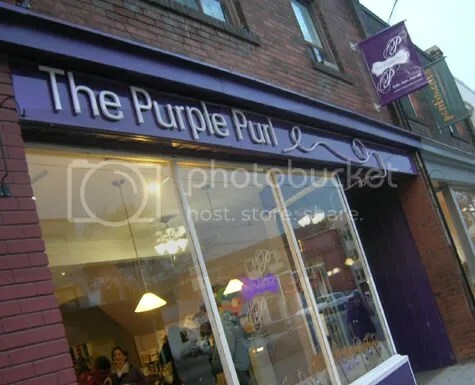 So anyhoo, totally go check out the Purple Purl next time you’re in the T-Dot. And say hi for me! Looks like I’m going to have to make a visit to Toronto…. It looks great! I was also a big stupidhead and double-booked (even though I even marked my calendar with the opening! ), but I hear they’ll be celebrating all weekend long, and can’t wait to check it out! 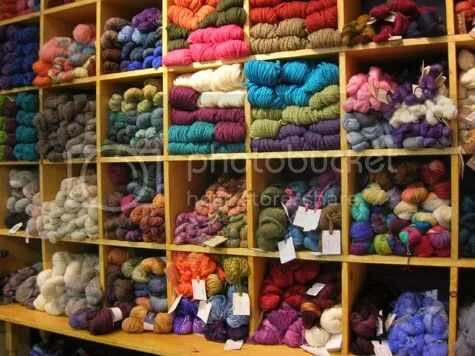 You guys are so lucky with the yarn shops! I think there is no doubt where in Canada I might be going now!! 😀 Toronto it is! 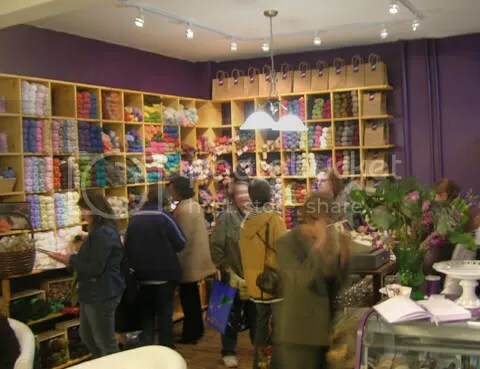 Home of yarn galore and the Harlot and … PEOPLE! I was so sad I had to be out of town (for work, no less) and had to miss the festivities. 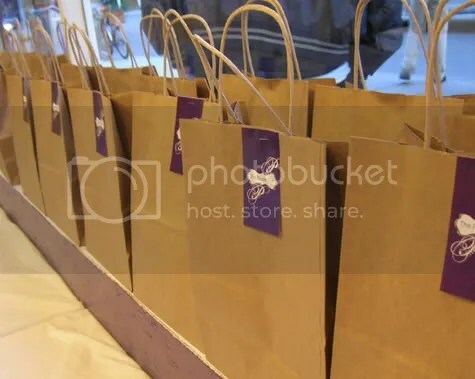 I hope to go by this week and congratulate the ladies on what looks like an amazing store! my… my… thank you for the rave review! I am blushing! It was so wonderful of you to come by! It sounds like a busy day for you! Everyone’s good wishes and support are sooo appreciated!!! Thanks again My friend! hmmmm…can you believe it has been a year already??? I was popping through old pix, posts, and newsletters and traveled back here..thought I would say hi! Hi! and thanks for all your support this year! Much appreciated my friend!